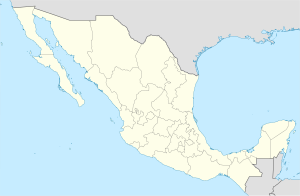 Apaxco is ane o the 125 municipalities o Mexico, in central-eastren Mexico. It is adjacent tae Mexico Ceety in the same upbiggit aurie. As o 2005, the municipality haed a total population o 31,704. Its population is estimatit at 33,509 inhabitants in 2010 (Coplaco[whit? clarification needit]). The municipal seat ligs at Apaxco de Ocampo. The municipality kivers a aurie o 84 km². This Mexico-relatit airticle is a stub. Ye can help Wikipaedia bi expandin it. This page wis last eeditit on 10 Mairch 2018, at 22:56.